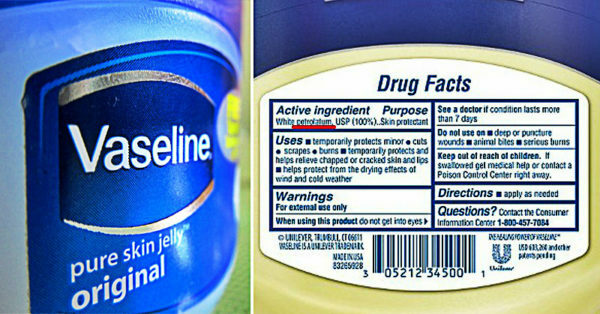 Vaseline, also known as petroleum jelly, is a byproduct of the oil industry. As such, it`s far from being eco-friendly ingredient. Its first use dates back to 1800s, when it was found coating the bottom of oil rigs. Petroleum jelly holds in moisture in the skin by creating a protective barrier. This is why it`s often included in lotions and baby products. The barrier this ingredient creates tends to block the pores and retain bacteria and residue within the skin. For instance, when used on burn, it locks the heat and inhibits body`s natural ability to heal itself. However, this is not all! There are more reasons why you should avoid Vaseline at all costs. Check them out! Lipid pneumonia is a rare condition which occurs when small amounts of petroleum jelly are inhaled and accumulated in the lungs. Given that the body is unable to metabolize the substance, it is very likely that an inflammation in the lungs will occur. Estrogen dominance is a term used when the body has low progesterone and high estrogen levels. It has been associated with allergies, autoimmune issues, menstrual problems, and infertility. Xenoestrogens, chemicals found in petroleum jelly, are believed to stimulate estrogen problems. Because of the protective barrier it creates on the skin, petroleum jelly inhibits skin`s ability to breathe and absorb nutrients. Consequently, the skin starts pulling out necessary nutrients from within, which in turn leads to collagen breakdown.